The San Francisco Community Health Center began has had a long journey since it’s founding in in 1987. 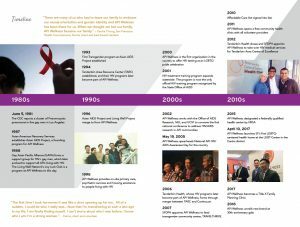 We grew out of the response of the 1980s AIDS crisis, specifically supporting the impact of the epidemic on the Asian and Pacific Islander community. In 1996 we launched as API Wellness and since then we have worked hard to remain rooted in API communities while welcoming anyone who needs our services. In 2015 we became recognized as a Federally Qualified Health Center (FQHC) which allowed us to greatly increase our clinical capacity and serve much more of our community. We became San Francisco Community Health Center in 2018 to fully encompass all of programs and services we offer and reflect the entirety of who we serve. Click below to see more of our history.